An Israeli archaeologist has warned that an entrance way to a Jerusalem holy site is in danger of collapsing after a supporting wall fell down. 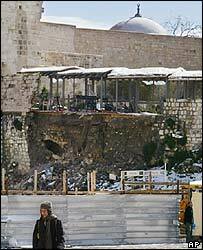 Part of the 800-year-old wall leading to a compound sacred to Jews and Muslims crumbled at the weekend. "A major collapse at the site, which would cause a major disaster, is only a matter of time, Eilat Mazar, of the Hebrew University, told Haaretz daily. Islamic militants have blamed Israel for the collapse and vowed revenge. The elevated pathway leads to the Mugrabi - or Moroccan - Gate, used by non-Muslims to enter the compound, known to Jews as the Temple Mount and to Muslims as Haram al-Sharif. A number of cracks and fissures have appeared in the compound's outer walls in recent years. Israeli engineers have suggested heavy snowfall and a small earthquake last week might have destabilised the embankment, causing the wall to collapse. Hamas said the wall fell down because Israel had tried to undermine the foundations of the al-Aqsa mosque, which is situated in the compound. "We warn the leadership of the enemy that the reaction of Palestinian resistance to the continued plans to destroy al-Aqsa mosque will be beyond their imagination and will topple the situation on their heads," Hamas said in a statement. Israel has been carrying out archaeological excavations in an area outside the compound, inviting the charge that they are trying to destabilise the mosque, Islam's third holiest site. Israel has strongly denied the allegation. Israeli officials have said the Palestinians' Waqf authority - which looks after the compound - might have weakened the area by carrying out unauthorised underground work in the compound.